The floors in the front room are being redone this week. Please enter through the big WOD room door at the end of the parking lot. Bathrooms and showers are off limits. Portapottys are in the parking lot. Thanks for your patience! 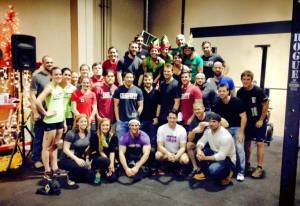 Great job to all of our athletes who competed in the Santa Series of the Upstate Affilate League Saturday! !